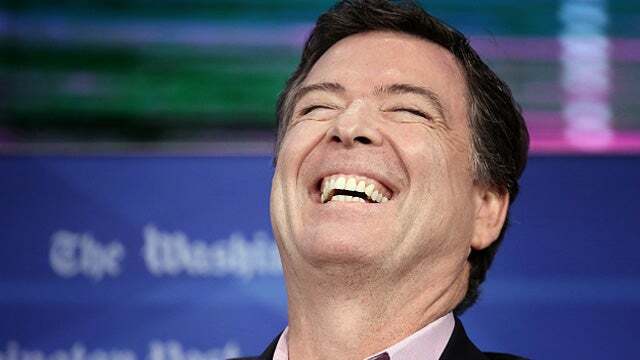 RUSH: In other lighthearted news, James Comey. Did you see? These are bizarre comments James Comey made yesterday at a cyber security conference outside San Francisco. By the way, does anybody find it strange that Comey is still out there weighing in on all this? He’s been fired. He has been repudiated. He was discredited in a lot of this. Yet he’s still out there. Clapper’s still out there. Brennan’s still… Well, Brennan’s kind of gone underground. Electronic surveillance? What is he talking about? If electronic surveillance is not spying… It doesn’t matter if it’s court-ordered or not, doesn’t matter if it’s court-authorized or not. It’s still spying. The vast majority of the spying in the world is authorized by some government or another. These people know, folks. I’m telling you, they know, and they are quaking in their boots. And you know another reason, you know another way you can tell? Here comes Barr at his testimony on Wednesday. In response to a question, he says, “Oh, yeah. Yeah. I think there was spying going on,” and what was the reaction to it? “You can’t say that! (sputtering) That’s outrageous. That is off the charts! That’s beyond the pale! That’s beneath the dignity of the office! You can’t say the FBI was spying!” As my friend Andy McCarthy pointed out, these are the same people who were calling Trump a traitor. They were calling Trump a Russian agent. They were calling Trump Adolf Hitler! So they can run around and they can say that Trump is a traitor, that Trump is a foreign agent, that Trump is a Russian spy, that Putin is running and controlling Trump, but Barr cannot say what the FBI was doing was spying? I think a lot of people are properly quaking in their boots about now. But it is especially preposterous to hear Comey claim that his FBI went to the FISA court four times for warrants to spy on Carter Page using a political opposition research document created by the presidential opponent of Donald Trump. Does Comey not know that foreign intelligence surveillance, FISA, the Foreign Intelligence Services court, is what it is. The Foreign Intelligence Surveillance Act, FISA. Does he not know that’s a synonym for spying? “What is he talking about? He know they’ve been caught. (sputtering) I — I — I never consider spying. Spying, such a despicable word. We don’t — we don’t spy. We do court-ordered surveillance.” Maybe Comey only believes in spying when you spy on foreigners. When you spy on a political opponent’s campaign, maybe I guess that’s okay. Or maybe when you spy-on-U.S. Naval Academy graduate who had even worked for the FBI as an informant, I guess that’s okay. That would be Carter Page. I’ll tell you, folks, it’s… I just have this sense. You know, and I’m kind of going out on a limb here because I don’t have any knowledge to back this up. I just have the sense that Barr and everybody here is just really, really serious about this, because everybody paying any attention to this has got to be fully aware of the absolute over-the-top outrage this was.